Acrylic Painting has become extremely popular today with artists all over the world. No longer do we have to worry about odors and allergies to solvents, so common to oil painting. Another advantage of painting with acrylics is their versatility of use and their relatively quick drying time (often just a few minutes.) However, if a longer drying time is needed in specific instances, a medium for use with acrylic paints has been developed. For these reasons, acrylic painting is often considered a much more desirable method of painting. 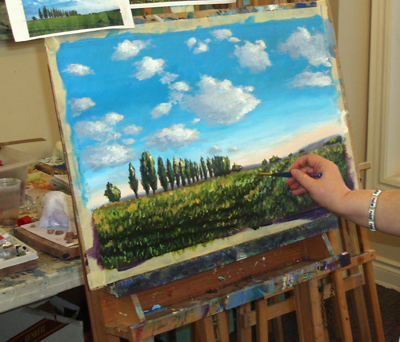 At Art One academy we offer acrylic painting programs for kids, teens and adults. Learning acrylic painting is not as daunting as it may seem. Many acrylic artists and instructors have developed their own methods, tools, techniques and instructions, making the learning process much easier. Featured work: Irina is our adult student taking our acrylic painting class. Here she is painting landscape form a photo. I am now planing to study basic drawing. I am interested in finding out more about your classes: when, where, cost.